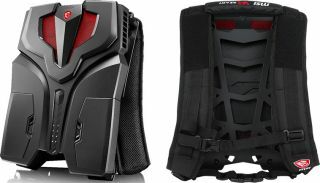 MSI's VR One backpack isn't likely to break your back at just under 8 pounds of heft, but with a starting price of $2,000 for a configuration that includes a GeForce GTX 1060 GPU, it could put the hurt on your wallet. We've been seeing glimpses of the VR One throughout year, most recently during a September reveal at the Tokyo Game Show. MSI kept mum about the spec sheet and price tag the whole time, though now that it's available to pre-order, there's no hiding either one. The burlier configuration (6RE-006US) costs $2,300 and bumps the GPU up to a GeForce GTX 1070 with 8GB of GDDR5 memory while doubling storage to a 512GB SSD. Both setups sport four USB 3.0 ports, a Thunderbolt 3 port, mini DisplayPort and HDMI 2.0 ports (one each), separate headphone and microphone jacks, Killer 1535 Wi-Fi and Bluetooth 4.1 connectivity, and a pair of 8-cell batteries (90 Whr) that MSI says are capable of providing 1.5 hours of "full speed" gameplay. The VR One is primarily intended for use with headsets like the Oculus Rift and HTC Vive. However, it can also be removed and used like a desktop of sorts. "When removing both batteries and using it as a stand alone PC system, MSI VR One is even lighter and more compact than some high performance gaming notebooks," MSI says. "Moreover, it easily substitutes traditional desktops. One of the stunning abilities this super gear possesses is running a surround mode on three external 4K@60Hz monitors." The cost of entry here is obviously steep, though if comparing it to a laptop with a GTX 1060 inside, it's not egregious. Of course, laptops come with a display and this doesn't. In any event, if the VR One tickles your fancy, you can place a pre-order on Newegg. It's estimated to ship on November 30.